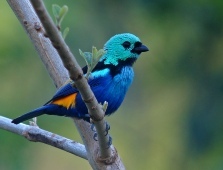 In the Neotropics, some 230 threatened bird species (about half of those that occur in the region) have been extirpated from significant parts of their range. On average, about a third of their total ranges has been lost. Particularly high densities occur in the Atlantic Forests of Brazil owing to extensive destruction of lowland evergreen forest driven by logging, agriculture and urbanisation. In the Neotropics, some 230 threatened bird species (c.50% of those that occur in the region) have been extirpated from significant parts of their range. On average, c.30% of their total ranges has been lost, varying from 2 (c.40 species) to >20,000 km2 (c.70 species). 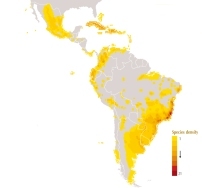 This analysis is based on a review of areas or sites where species were recorded historically but not recently, or where habitat loss or other threats seem certain to have resulted in their disappearance (analysis of data held in BirdLife’s World Bird Database). Species in some places have been harder hit than in others. For example, in Cuba, 11 threatened bird species have lost substantial parts of their range across the island owing to widespread habitat destruction and degradation of dry forests, scrub and wetlands. In Argentina, ranges have shrunk significantly for 20 threatened species. These include many that rely on seasonally wet grasslands, which are no longer suitable owing to cattle ranching and drainage. In Brazil, 76 threatened bird species are affected, particularly in the Atlantic Forests, where there has been extensive destruction of lowland evergreen forest owing to logging, agriculture and urbanisation. In some areas 21 threatened birds have disappeared: the highest recorded density of extirpations of threatened birds in the world. Losses of range are inevitably associated with a reduction in the total numbers of individuals and hence an increasing risk of extinction. For example, in the Neotropics there are 17 species on the brink of extinction (categorised as Critically Endangered) that have lost over 99% of their former ranges. Declines in range, and hence in population size, are by no means confined to the Neotropical region. In total, 462 globally threatened bird species (38%) worldwide have been identified as at risk for this reason (BirdLife International 2004). BirdLife International (2004) Threatened birds of the world 2004. CD-ROM. Cambridge, UK: BirdLife International.